Sweet rocket is an upright, multi-branched, perennial or biennial. It has white, lavender or purple, flowers that are very fragrant, particularly in the evening. 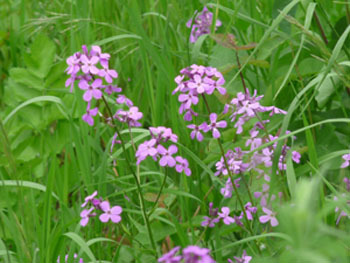 (Hesperis comes from the Greek word for evening.) 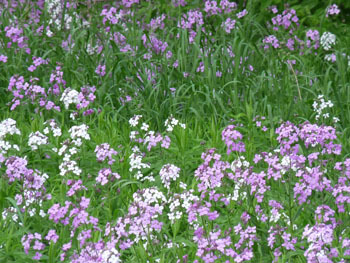 Native to Europe and Asia, this plant has naturalized in many areas of eastern North America and appears in some western areas of Canada and the U.S.
Distinguishing Features: Sweet rocket is often mistaken for phlox but there is an easy way to tell the difference; sweet rocket flowers have four petals and phlox has five. 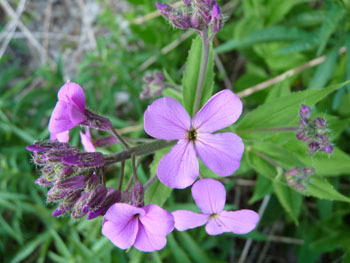 Also, sweet rocket leaves are alternate and phlox has opposite. The plant is part of the mustard family, which also includes radishes, broccoli, cabbage, and cauliflower. 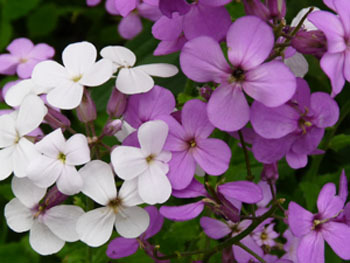 Flowers: Sweet rocket flowers typically bloom between April and July depending on location. The flowers are hermaphrodite and are pollinated by bees and other insects. It is noted for attracting wildlife. Flowers measure about 1.2 cm and are loose, terminal racemes (rise singly from the upper leaf axils). Fields of Nutrition has medicinal benefits and vitamin/mineral content of Sweet Rocket. Leaves: Sweet rocket leaves are lance-shaped, alternately arranged and are dark green. 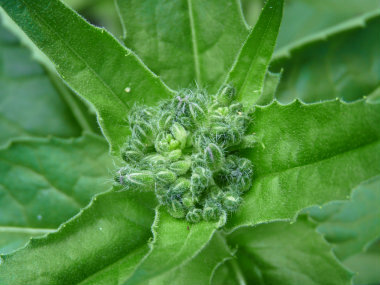 They are hairy on both sides and have serrated edges. Leaves decrease in size as they ascend the stem. They grow between 1-4 cm wide and can be anywhere between 4-15 cm long. Height: Sweet rocket plants can grow anywhere between 60 centimetres to 1.2 metres tall with an average height of 1 metre. Habitat: rocket typically grows in woodland edges, meadows, along roadsides, and in open areas. 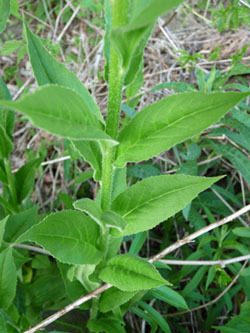 Edible parts: Young leaves can be tossed into salads and other dishes. They do have a bitter flavour although it adds an extra tang to salads. For culinary purposes, the leaves should be picked before the plant flowers. The seed can be sprouted and added to salads. The seed contains 50 percent of edible oil. Flowers can be tossed into salads.